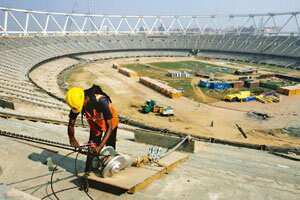 New Delhi: India has more than doubled the funds allotted for the 2010 Commonwealth Games and is convening a special meeting of the Union cabinet to review preparations. The decisions by the cabinet come after Prime Minister Manmohan Singh decided to become involved in preparations for the Games that have come in for significant criticism in the past few months. The Union cabinet on Thursday approved a new budget of Rs1,620 crore for the Games—more than double the earlier allocation of Rs767 crore. Soni explained that the budget was revised to account for additional expenditure to be incurred on the opening and closing ceremonies and the increase in the number of days for the Queen’s Baton relay—from 136 to 240 days for the international leg and from 60 to 100 days for the domestic leg. During the cabinet meeting, senior ministers including road transport and highways minister Kamal Nath and commerce and industries minister Anand Sharma sought an update on the state of preparations. As more members started raising questions over the preparations—the government’s audit watchdog, Comptroller and Auditor General (CAG), has said the preparations are inadequate—finance minister Pranab Mukherjee intervened and said the cabinet could meet again to review these, according to the minister mentioned in the first instance.